A reported fire in the roof at a local Convenience Store required the response of Guymon’s newest Ladder unit to assist in extinguishing the fire. Guymon Firefighters responded to a 911 call to Wes-T-Go Travel Center located at 1015 NE Hwy 54 at 7:07pm last night. “First arriving fire units found fire coming from the southeast corner of the building’s roof”, said Assistant Fire Chief Grant Wadley. Early reports indicated that the Convenience Store is currently having remolding done in the area where the fire was located. The fire was extinguished quickly by Firefighters before any spread of the fire to the rest of the building occurred. It took Firefighters on the ground and above the building using the new Ladder truck 10 minutes to have the fire under control. No one was injured and damages estimated at $5000-$7000. 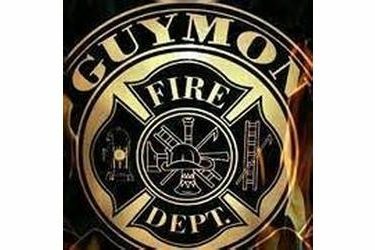 The use of new Ladder truck at a scene was Guymon Fire Department’s first. Use of ladders for fighting fires and saving lives has been a hallmark in firefighting history and tradition around the country. “Firefighters train on the uses and purposes of ladders everyday”, Wadley says. With the added use of our Ladder truck we can continue using ground ladders as needed but now have even a safer and more diverse methods of reaching higher places trying to protect property and saving lives.